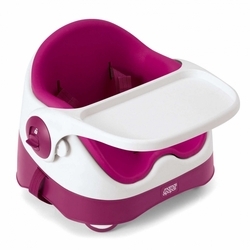 Baby Bud from Mamas & Papas is the perfect booster seat for bringing your little one to the table. With adjustable, non-slip feet, two chair harnesses for extra security and a removable, easy clean tray, your baby will feel like part of the family – and because it’s easy to carry and store, it’s ideal for using when you’re out and about. Baby Bud is comfortable and supportive for baby, and suitable from 6 months old, with a removable insert so it will give your little one a boost up to 3 years.